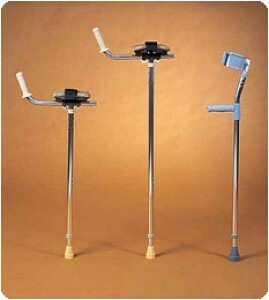 Crutches add a little more balance to persons with lower body injuries. By giving yourself at least one extra base leg to stand on, you'd be able to stay moving, while being upright at the same time. When the arms get tired; however, it becomes more difficult to stand upright despite the need to keep moving. Performance Health, manufacturers of pain relief therapy items, created the Platform Forearm Crutches in order to ease some discomfort associated with arm pain due to extended usage of crutches. Each crutch is designed with a hook-and-loop closure at the top of the crutch, allowing you to secure your arm in place for optimal usage. Once in place, an angled and easy-to-grip handle gives you more control of the crutch and can be adjusted to suit your needs. The body of the crutch is made with 1-inch dipped anodized aluminum tubing for additional strength, allowing the forearm crutch to hold up to 250 pounds. At the bottom, thick latex tips keep a firm grip on the ground. Push-Button adjustments can be made from the bottom as well, giving you the choice to increase or decrease height in one-inch increments. 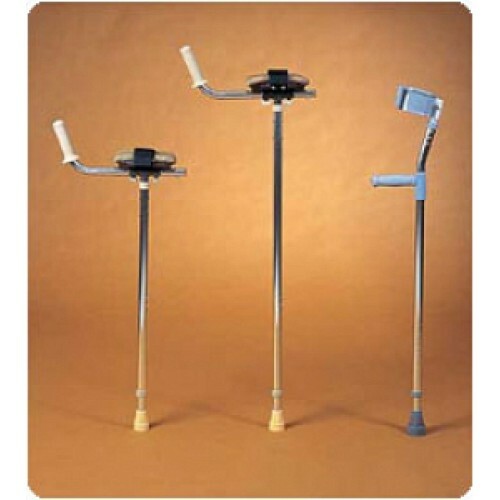 When you're done using them, these 2.5 pound crutches are light enough to be lifted and placed anywhere for easy access.